Renee West is a top producing real estate agent with Villa Real Estate. She’s known as a waterfront expert and has honed her knowledge and familiarity with Newport Beach, Newport Harbor and Corona del Mar in Southern California properties since becoming an agent in 1993. 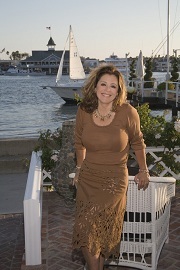 A resident of Newport Beach since 1983, Renee lives on the water herself and through the years has made incredible connections that serve to benefit all of her clients. Longevity, knowledge and drive earned Renee an Associate Broker’s license with the California Department of Real Estate (DRE) in 2007. A native Californian, she prior to real estate, Renee taught school in the Los Angeles Unified School District. She then became interested in business when she owned a high-end Newport Beach car dealership with a partner and went on to complete her MBA at UCI. Renee’s knowledge, education, attention to detail, energy and enthusiasm combined with her diligent hands-on involvement in transactions result in loyal clients and referrals. Since her early years in real estate, Renee’s performance and sales have consistently increased year over year. Initially with Coldwell Banker, she quickly became a first-rate agent and was recognized with Coldwell’s President’s Circle award and then the President’s Elite award. She moved to Prudential in 2000, which became Berkshire Hathaway HomeServices in 2014 where she ranked within the top five percent of more than 50,000 BHHS agents nationwide in 2000 and four short years later, Renee consistently was within the top two percent of BHHS agents nationwide. Now, she is with Villa Real Estate in Newport Beach, CA. In addition to being a top producer in Newport Beach with Villa Real Estate, Renee strives to be the best in her area, and maintains affiliations with numerous professional organizations. Being a Realtor, and not just a real estate agent, is important to Renee and providing knowledgeable and quality service to her clients is a critical aspect of her business. Please call Renee for more information on the marketing and outreach Renee West can do for your home – whether waterfront of luxury. Renee is always available for home buying and home selling assistance. She can be reached on her cell phone at (714) 914-9060, or via email at Rwest@VillaRealEstate.com. Villa Real Estate is located at 450 Newport Center Dr #100, Newport Beach, CA 92660. Stay up-to-date on real estate information, news, and more by reading her blog at www.ReneeWestBlog.com or by following her on one of the social media sites on the right.